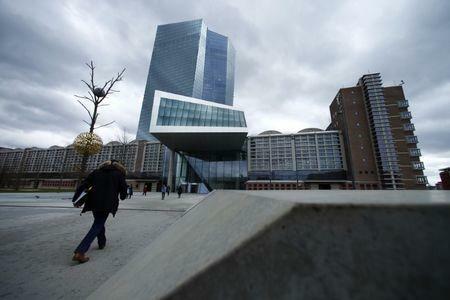 FRANKFURT (Reuters) - Euro zone banks expect demand for corporate and household loans to increase further in the third quarter with credit standards also easing, the European Central Bank said in a quarterly survey of the bloc's top banks. In the second quarter, banks saw increased demand for corporate, housing and consumer loans and said credit standards -- internal guidelines or loan approval criteria -- also eased for all three categories, the ECB said. "Banks’ overall terms and conditions on new loans continued to ease across all loan categories in the second quarter of 2018, driven mainly by a narrowing of margins on average loans," the ECB said. It added that competitive pressures and risk perceptions contributed to an easing of credit standards in the second quarter, while banks' risk tolerance, their cost of funding and balance sheet constraints had a broadly neutral impact.